1. Combine the yogurt, cream, chilli powders, pepper powder, ajwain and salt in a bowl. 3. Mix the raisins, fennel powder and sugar with the mint chutney. 4. Cut the paneer pieces into halves and spread the chutney mixture on one half. 5. 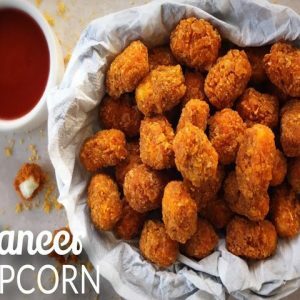 Cover with the other half and place them in a bowl. 6. Pour the yogurt mixture and marinate the paneer pieces for 10 minutes. 7. 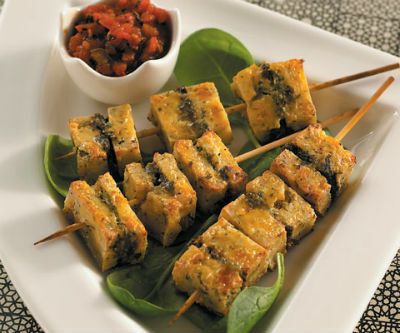 Skewer the paneer pieces and cook in a preheated oven for 2 to 3 minutes at 140C/275F. Feel free to comment or share your thoughts on this Saunfia Paneer Tikka Recipe from Awesome Cuisine.